This may or may not be of any help to you, depending on how much you trailer. I have the same problem, no marine or marina pump out stations. What we do have though, is a lot of RV sanitary dumps in rest areas along the highways. Since we trailer all the time, I thought, if the RVs can dump there, why not me. I bought a 12 volt Sea-Land Diaphragm type (needs to make vacuum) sanitary pump and the fittings to hook up to my pump out fitting in the deck. Now I can just pull into any rest area or any other place that has an RV dump and empty my tank, just like the RVs do. Built the thing into a plastic tool box so everything can be rolled up and put inside it again once it is rinsed off. Then I can store it in the lazerrette or under the seats until I need it again. It will work as a bilge pump too, if I need it . Got the pump at West Marine. When I am lucky enough to hit a marina with pump out facilities, it is just a simple matter of just using their pump instead of mine. By the way, my boat doesn't even have a through hull for discharging the sanitary waste to the water, only the pump out fitting in the deck. I gave this some thought before I went ahead with it because this pump is not all that cheap. I have had the opportunity to try it out while doing last fall's winterizing. I found it works about the same as the pump at Light House Landing (KY Lake), which is the only marina's pump out facilities I have ever used. I got the tool box at Fleet Supply, one of the local farm supply stores. It's not too special other than I wanted plastic, I set the top tray that came with it aside for use elsewhere. 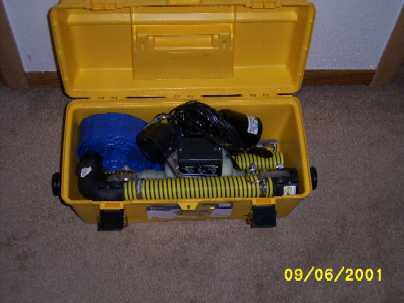 The outside dimensions of the tool box are approximately 20" long x 10" wide, 6 1/2 inches deep, lid open and 9 1/2 inches tall, lid closed. Think I paid $9.99 for it. This one happens to be a Master Mechanic brand. I was also able to get the hoses and fittings at the Fleet Supply store. They are really irrigation fittings and I may have gone a little overboard on the fittings, but I wanted to be able to stow as much of this stuff in the box as possible when I wasn't using it, and not have to mess around pushing hoses onto hose barbs and tightening clamps, etc.. All hose connections other then the ones inside the box are quick disconnects. 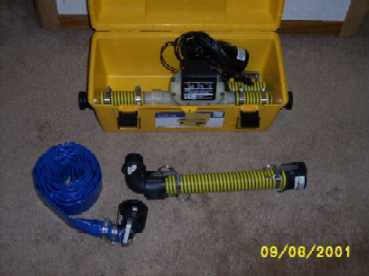 All of the hoses for the suction side of the pump are 1 1/2 inch irrigation suction hose as is the discharge side, up to the fitting where it exits the box. I thought about bolting the pump to the bottom of the tool box, but I decided that the suction hose was rigid enough to hold everything in place by itself if I made the outlet and inlet holes the right height. 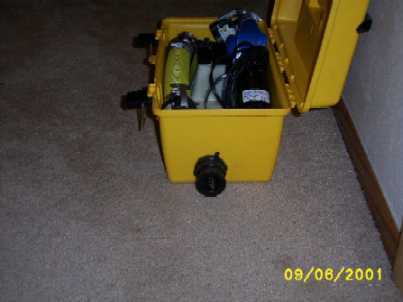 I used a 1 1/2 inch hole saw to make the holes in the ends of the box and cut the 2 pieces of suction hose so that they just filled the distance between the ends of the box, when installed on the pump. I then measured up to the middle of the hoses and centered the holes in the end of the box at that height. Both the suction hose and the entry and exit fittings are too big overall to fit through the 1 1/2 in hole, but the hose barb end on the fittings just fits through. So, when you push the fittings (outside) into the hoses (inside) from the outside of the box, everything becomes captured when the ends of the box are pinched between the end of the hose and the flange on the fitting. When everything is stowed inside all you see is a toolbox with a fitting sticking out of each end. The pump is 12 volt, so I just got a cigarette lighter plug and enough wire to reach to the 12 volt outlet in the cabin. The boats batteries can now run the pump so I can use it no matter when it is needed for either discharge of sanitary waste, or in the event of a problem, a bilge pump. This would also work fine if one was out to sea and wanted to direct discharge to the ocean, although I don't foresee that happening for me in the near future. If you want to know anything else, or if I wasn't clear enough about some aspect of this project, feel free to ask any question that come to mind. If everything didn't come through OK let me know. The original plan (back when we were buying the boat) was to put a through hull in that could be threaded to accept a fitting and in turn a hose could be attached to for emptying at land based sanitary facilities. Then, the macerator pump would have been located inside the boat, like it normally would be. I think that the first problem with this was locating a suitable through hull fitting that could be threaded to accept standard size plumbing fittings. The second problem was, eventually you'd wear it out or damage it, and you don't need that with a "below the waterline" through hull. Third, legality might have been an issue. Didn't know how the authorities in different areas might react to a sanitary through hull in fresh water, even if we could plug it from the outside. I think this system will let us have the comforts and capacity of the marine head, with the versatility of a porta-pottie and no through hull.